Gas Engineer Sussex. Gas Boiler service and repair to combi boiler. Anything Gas Certified Engineers specialise in the installation, breakdown, service and repair of the following. • System boilers, Combination Boilers, Back boilers and all condensing boilers. • Gas freestanding Cookers, Inbuilt Ovens, Hobs. • Gas Fires & Stoves including all flueless stoves. • Static Caravan gas appliances. • Gas central heating system powerflush. • Gas safety checks and Landlord Gas safety certificates. • Gas Certified Engineer, Gas Safe, Quality work and Fully insured. We are Gas engineers Sussex and we fit, repair, service all type of gas appliances. We offer: Boiler Servicing in East Sussex from towns around Heathfield, Hailsham, Tunbridge Wells, Uckfield and many more. Gas equipment repaired and serviced: Gas Aga, Rayburn, Esse, Fire, Cooker, Range Cooker, Water heater, Central heating, Stove. 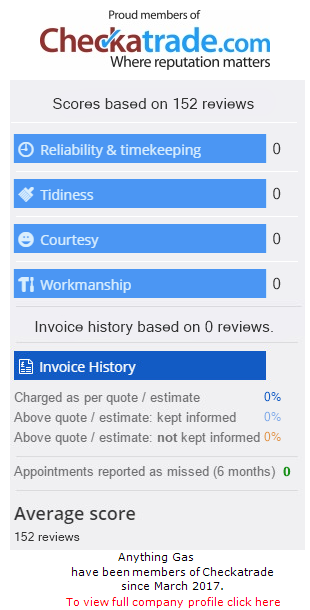 View our 2018 CheckaTrade Report, this report list what we do and reviews from our customers.